At the bottom we have this pop-up for relationships which is are so far only relationship terms for concepts. But what about for other types of entries, such as people (in the case of Chris), places, documents, things, projects, companies and so on? How should we organise the types? What are the categories we should cover? I don’t mind having a few, but it should be super-quick to assign from a pop-up or from buttons (ideally, since that’s faster), but it can’t be too many. I think once he category of ‘this is’ has been set, the pop-up options for relationships with other posts can dynamically change. What do you think? My goal is to make this EASY and QUICK for a regular writer to add but also nicely connected in your knowledge graphs once ingested. Heh. Frode, you’ve discovered graphs. trivially express your concepts as an RDF graph. My approach in (Mindgraph) to this is to let people enter freely some text to indicate the kind of relationship they had in mind. Ensure that the t relationships they introduced on the fly can are defined in their own a meta glossary. The key point is that the system maintains a list of existing relationships and can be accessed via autocomplete search boxes at the right places. In a private personal knowledge work setting this can be very powerful and useful way to help to make sense of what is being recorded. This could be done for the demo, just make sure that a nice neighborhood emerges. At some point, as people start collaborating they will encounter other peoples ‘relationships’ and can then decide to define equivalences and decide which ones to use. The system should cater for propagating these changes. Ultimately Team and Community servers in HyperKnowledge should provide the means for storing and developing conversations over emergent repositories for relationship concepts, and can even over recommendations for specific contexts. In the peer to peer world it is my ambition to build Conceptipedia, a graph based emergent encyclopedia of relationships and situated regulative meta concepts. Using WordPress as a collaboration point, these meta glossaries can be published and searched for, giving a way to share relationship names along with the content in which they figure. I think that different things have different relationships though, and we should make this easy for the author to specify. A person can have relationships like ‘friends with’ but a concept could have another unique one such as ‘thought up by’ and so on. 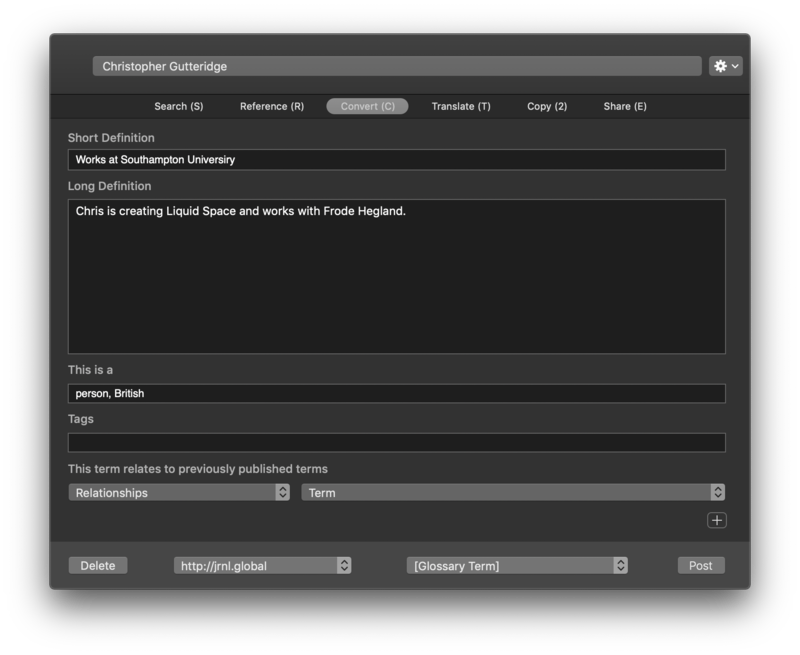 Hence I’d like a useful set of ‘types’ to choose from, then the relationship list will automatically update. HOWEVER, I think I’ll follow Guyri’s method to start with and just allow the user to type in a relationship. BTW, all, does the formatting of the result suit you? Existing Ontologies were devised with a view to structure and make human knowledge amenable to be processed by machines in terms of propositions precisely because machines cannot make sense of text. People are capable of making sense of text, and the kinds of relationships they may be interested in not just between things, but more between ideas about things and much more, that are situated and higher level and go “Beyond Ontologies” https://hypothes.is/a/jCvjfkrKEeiA8EOxywU6GQ. aimed primarily at augmenting human capabilities not making machines more powerful.